I began working for Special Olympics Illinois in April of 2014, before which I had never been to a Special Olympics event of any kind. I remember sitting in the stands of my first Special Olympics Spring Games and as the parade of athletes started across the field of Prospect High School time stood still. The movement engrossed me and it was then that I realized how important the organization was and how I proud I was to be a part of it. 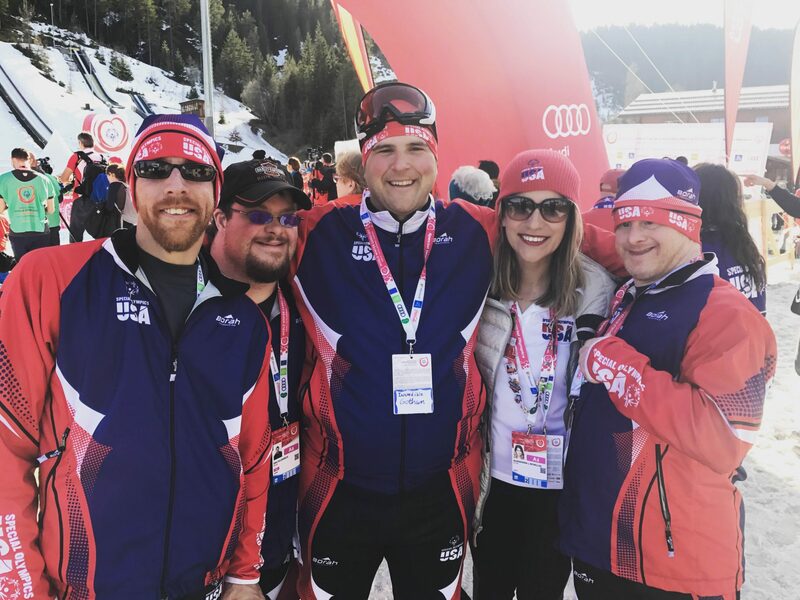 I get that feeling often working for Special Olympics Illinois and working on the USA communications team for the 2017 Special Olympics World Winter Games in Austria was no exception. 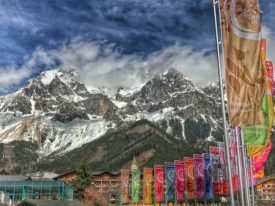 The 2017 Special Olympics World Winter Games took place March 14—25 in Schladming, Ramsau and Graz, Austria. It was the largest sporting and humanitarian event of the year, and the largest World Winter Games to date. 3,000 athletes from 117 nations competed in nine indoor and outdoor team and individual winter events, including Unified sports. 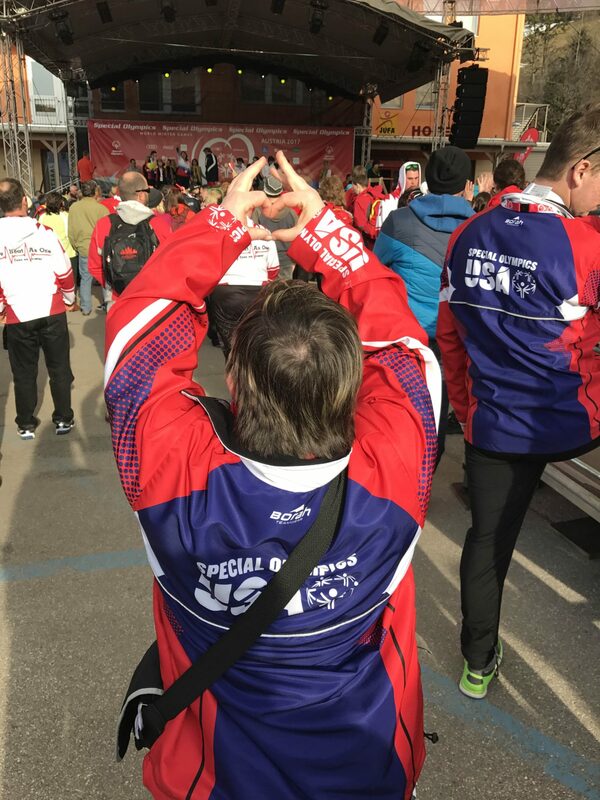 Special Olympics USA was a 200-member delegation comprised of 140 athletes, 40 coaches and approximately 20 delegation members who supported team operations. Team members competed in seven sports: alpine skiing, cross-country skiing, figure skating, floor hockey, snowboarding, snowshoeing and speed skating. The full USA Delegation assembled in D.C. for their official send-off to the 2017 Special Olympics World Winter Games. It was the first time we were all together since our week at Training Camp in Killington, Vermont. As we waited for different states to arrive, a group of athletes, coaches and I ventured around D.C. The group bonded as we explored Pennsylvania Avenue and the historical monuments that make up the United States Capitol. Alpine skiers Gary, Trevor, Vincent and Cedar took selfies in front of the Washington Monument and Lincoln Memorial before dinner. Special Olympics USA premier sponsor Bank of America threw an official send-off party for the delegation complete with volunteers decked out in American pride. They formed a tunnel and cheered in the athletes. Dustin Plunkett, ESPN correspondent and retired Special Olympics athlete, co-emceed the event that evening. The SO Cheer group and Wolfgang Waldner (the Ambassador of Austria to the US) wished all the athletes good luck. We were served an authentic Austrian meal and afterwards there was, of course, dancing! After a good night’s sleep, the team was off to the airport and onto Vienna! Every World Games, communities around the venue locations host delegations for 2-3 days in advance so that athletes can acclimate, rest, condition and most importantly, experience the culture and people of the host nation. AMS, a semiconductor company in nearby Premstatten, treated the Special Olympics USA delegation to an outstanding host town experience full of adventure and fun in Graz. The team broke into two groups for a tour of the Riegersburg Castle and the Zotter Chocolate Factory. To reach the castle, everyone traveled by cable car – a short trip with a beautiful view of the Graz countryside. 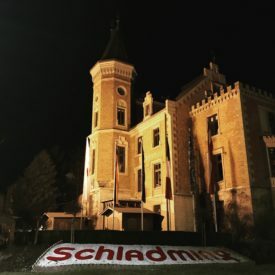 Then, the athletes, coaches and delegates embarked on a guided tour where they learned about the Lichtenstein family and how the castle came to be. The Zotter Chocolate Factory was a sweet treat for the delegation. Josef Zotter, known as the “Willy Wonka of Austria,” greeted the group before they tasted dozens of types of chocolate – from raw beans to fully processed bars! The two groups merged for lunch at the base of the Riegersburg Castle where Prince Emmanuel, the castle’s current owner, greeted them. The evening concluded with a party by our host AMS. The athletes enjoyed authentic song and dance performances, authentic Bavarian fare and the pantomime of McBee! Then it was time to split the group. While the floor hockey team, speed skaters and figure skaters stayed in Graz, the alpine skiers, snowboarders, cross-country skiers and snowshoe athletes moved on to Schladming and Ramsau respectively. After settling into our new hotels, the athletes trained in their designated venues – the skiers and snowboarders took to the mountains in Rohrmoos while the snowshoe athletes and cross-country skiers practiced in Ramsau. 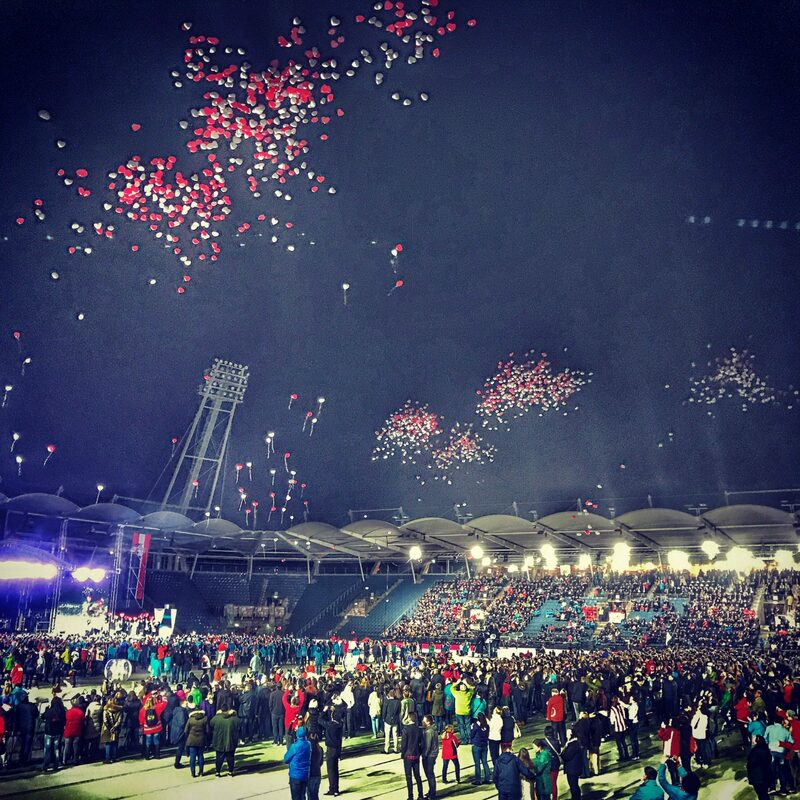 Then it was time for the 2017 Special Olympics World Winter Games Opening Ceremonies. We waited; lined up by country, in our matching coats and scarves and the delegation started a “USA” chant dozens of times, almost competing against the other countries’ own chants. As the music and announcements from next door filtered in, the anticipation skyrocketed – that sort of nervous excitement complete with wide smiles and butterflies. As the athletes chatted, giggled, and took photos, they almost missed Olympic Gold-Medalist Michelle Kwon who snuck into line for a photo with the figure skaters. The sea of red coats and USA scarves started marching towards the ceremony and Mrs. Karen Pence, the Second Lady, John Skippers, President and CEO of ESPN, and Muhtar Kent, CEO of Coca Cola, joined us to lead the delegation to the stage. Walking into Planai Stadium with the Unites States Delegation literally took my breath away. I was so overcome with emotion I was afraid I would not remember it, but thankfully I can still recall every detail of the packed stadium. The rain sparkled under the bright lights as the athletes danced and waved their way in, faint cheers of USA barely audible over the music and crowd. After the Opening Ceremony, I actually thought my grin might be permanent. Returning to the hotel for the day, I ran into crowds of people cheering for their friends on stage and the reactions were always amazing. The alpine skiers and snowboarders received ribbons and medals outside my hotel in Schladming. The mix of happy tears, pride and general excitement coupled with the overwhelmingly outstanding sportsmanship was incredible. When the ceremony was over, we explored Olympic Town, complete with music and games, and ventured out for ice cream or Austrian pastries. My absolute favorite part of the Games were the friendships. By the time we got to Austria, we already had fond nicknames for one another. The BEST parts were walking down to breakfast, being greeted by hugs and excitement for the day, eating sc hnitzel for dinner with the alpine skiers and snowboarders, and hearing nightly recaps of personal records. We also made fast friends with our translators and drivers. Watching the athletes connect instantly and form best friendships with those from other countries was inspiring. The excitement of World Games transcended the language barrier. In that moment, you remember exactly why you are doing what you are doing. You forget the long hours and how tired you are, and instead wonder what more you can be doing to make this experience perfect for the athletes. 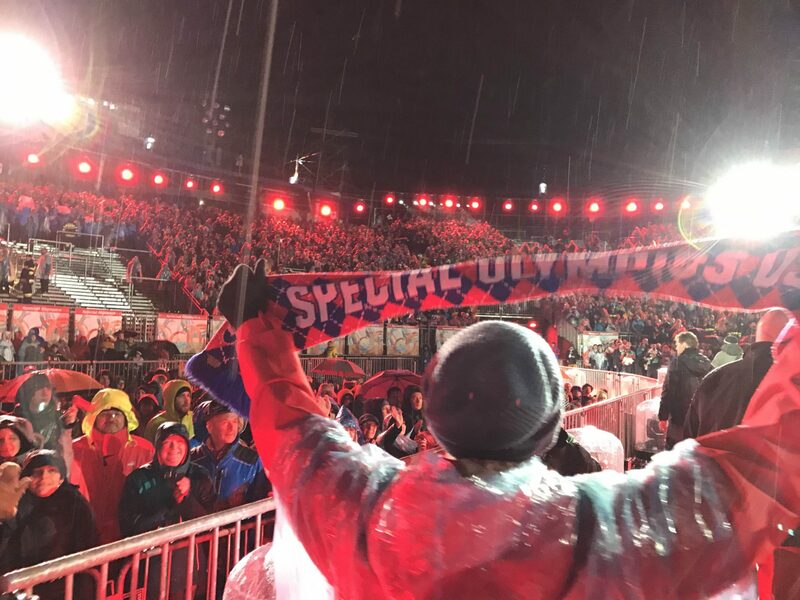 Later, Arnold Schwarzenegger thanked the region of Styria for presenting such an outstanding World Games experience for the athletes, coaches, families, volunteers and more. The flag was officially passed to representatives from Abu Dhabi and the Flame of Hope was extinguished. 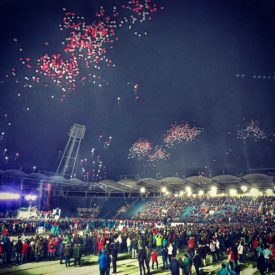 Austria’s “Heartbeat for the World” theme rang true as hundreds of heart-shaped balloons were released into the open air. Afterwards “Celebration” filled the arena as a firework show dazzled the audience. We said tear-filled goodbyes as the states began to separate for their return trip home. As I was taking pictures of the snowshoe relay teams towards the end of the Games, one team would not stop dancing for a photo. These men had just run their 4×100 relay and were too pumped by their performance to sit still. I jokingly asked if they were throwing their own victory dance. 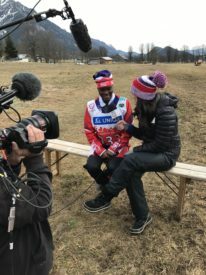 I will never forget Jamiah’s smile as she crossed the finish line in her pink snowshoes – the only girl in her 4×100 relay – nor will I ever forget how proud of her I was when she gave her best interview to date with ESPN about her success. I will never forget Robert’s enthusiasm on the medal podium when he received his 4th place ribbon for snowboarding, or Daniel and Kristen’s infectious smile no matter what time of the day it was, no matter what the reason. The joy and courage the athletes possess and share is beyond inspiring. When I returned home assimilating back into my regular routine was difficult at first, but it was also empowering. I brought back a few Austrian chocolate bars, beautiful drawings from athletes Kelly and Patrick, new friendships and so much pride, but the best souvenir was Justin’s quote. Every day IS a victory dance. It was amazing to witness Special Olympics on a worldwide scale – surrounded by thousands of people who are celebrating athleticism, spirit and inclusion. World Games Austria reminded me that Special Olympics is not just a sporting event, but also a movement. 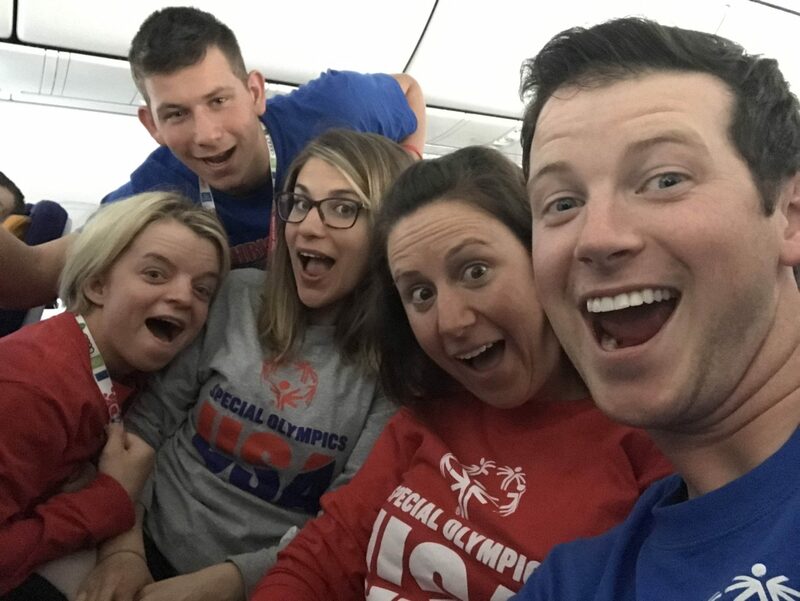 I am so grateful for the opportunity to have traveled with the USA Delegation for the 2017 Special Olympics World Winter Games.